Who Were the Ku Klux Klan (KKK)? Long reviled by most outsiders, the KKK believes in the superiority of "whites" and Protestants over other peoples. The Klu Klux Klan were a hate group originating in the United States. The Ku Klux Klan (KKK), also commonly referred to as “The Klan”, were three noticeable movements in history (and the present). These movements openly supported and carried out extremist reactionary current acts such as white superiority and nationalism, xenophobia, and, more distinct in the later Klans, Nordicism, anti-Catholicism, and anti-Semitism. They expressed their thoughts against people they opposed through acts of terrorism, such as murder and other forms of violence related to racial discrimination. All three Klans used costumes to disguise their identities and to cause fear, such as white conical hats and long robes. They all called for the “purification” of America and were classified as right wing extremists. The first Klan was founded in 1865 in Pulaski, Tennessee by six veterans of the Confederate Army as a social club inspired by the then mostly non-existent “Sons of Malta, and from whom they borrowed part of their initiation ceremony. The second Klan was founded in 1915 in Atlanta, Georgia, by William J. Simmons. He joined twelve different fraternity groups and recruited for the new Klan with his chest covered in fraternal badges. It was relatively unsuccessful until 1921 when they began to use a modern business system of using paid recruiters. The national headquarters made money through costume sales, and the organizers were paid with the initiation fee. Later on, several more similar independent Klans began forming at around the 1950s. They used the Ku Klux Klan name, costume, and terminology, but weren’t connected to the first or second Klan. They all opposed the Civil Rights Movements and desegregation using physical violence, intimidation, and murder/assassination. The first Klan started off as a mere fraternity social club. Groups similar to the KKK rapidly grew across the South after stressing the need to enforce prohibition and white supremacy, utilizing the same name and methods – violence (including the assassination of Republican politicians) and threats against both black and white Republicans in an attempt to restore white supremacy. The second Klan began with much less successfulness under the leadership of William J. Simmons. In 1920, William J. Simmons handed the national office to two professional publicists, Elizabeth Tyler and Edward Young Clarke. This new leadership invigorated the Klan, and it began to increase in size very quickly, peaking at over four million members in 1924-1925. Then, a civic group released a list of KKK members which resulted in a sudden decrease down to less than 6,000 members in the 1930s. 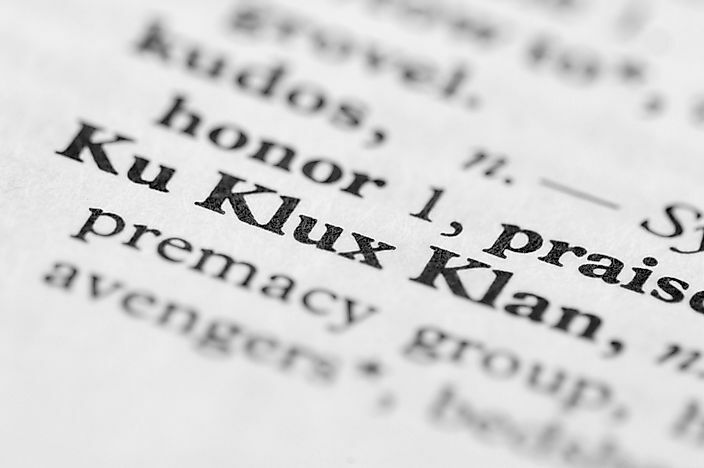 In the 1950s, several independent groups began arising using the “Ku Klux Klan” name, costume, and code words, but having no relation to the ones prior. However, they were not a large group, having 5,000 to 8,000 members. Union Army veterans organized an “anti-Ku Klux Klan” in an attempt to stop the crimes of the KKK. They threatened to retaliate if they didn’t stop burning black schools and churches and stop whipping unionists. Armed blacks began patrolling the streets to defend their homes. Hundreds of Klan members were apprehended by Federal officials and consequently prosecuted, and finally, the violence was halted, and the first Klan was ended. Many influential politicians began to speak out against the second Klan. Several organizations were formed to oppose the Klan, and a civic group released a list of KKK members which caused a drastic decline in Klan membership. The prosecution of the Indiana Klan’s Grand Dragon “D.C Stephenson” for murder voided the KKK’s claim to be upholders of the law. After World War II, author Stetson Kennedy began to spread the Klan’s code and ruined their mystique which also caused a decline in membership. The later Klans were called out by newspapers which revealed that hundreds of Klan members were arrested and prosecuted. The KKK was surrounded by armed Lumbees during a night rally, and gunfire was exchanged, resulting in the Klan members fleeing. This incident was known as the “Battle of Hayes Pond.” The Supreme Court further enforced the Enforcement Act, which ensured black people held the right to vote, hold office, be protected by the law, etc., and was used as a basis for the prosecution of several Klan members. Although the Ku Klux Klan did not succeed with their goals and have caused many people and groups of people pain and negativity, as a result of their civil movements, many more bills, laws, and enforcements were taken in order to improve our society to what it is now, such as the reinforcement of the Enforcement Act.